With all those blogs posts trying to explain to you about how to edit videos for Instagram, you must be overwhelmed. The plethora of ‘how to guides”, tips and tricks, hacks and what not must have made you confuse and the opportunity costs associated for selecting one and missing the other may also avert you from making your journey towards video editing a hassle-free process. 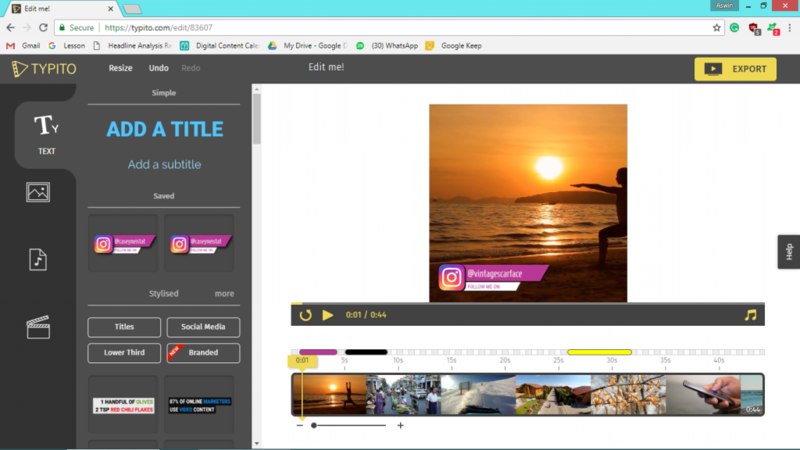 In this blog, we take a small peek on how to edit videos for Instagram. Here we are going to explain some unconventional principle which you can learn and use every day to edit videos. NOT, the one you are thinking anyway. Here we are going to adopt the (Keep It Simple, Stupid) KISS principle to make simple yet effective videos for Instagram. The KISS principle was long adopted by the U.S. Navy in the sixties to make their systems efficient. Yes, here we are also going to make things super simple, stupid and efficient. First of all, you need to shoot a good video to upload in Instagram. You can shoot with a small camera phone, your big smartphone, DSLR, or anything that’s lying around in your wardrobe. The idea is – create something new, engaging and worth sharing. Yes, make your Instagram videos square or vertical. Instagram likes square or vertical videos. If you have already shot your video in landscape mode, then you can convert it to square for Instagram and vertical for IGTV, and you are halfway there to make it viral like wildfire. Square videos outperform other kinds of videos, as these videos are optimized for mobile phones, it has more engagements. While vertical videos are getting traction in IGTV. The simple trick of square videos also works magic on Facebook, so you easily upload on Facebook Page as well as Instagram with the same video. Till now, square videos are successful video size ratio across social networks. But you should be aware of IGTV and its vertical videos. Even though vertical videos miss out the details compared to square or landscape videos, Instagram has gone for it and promotes creators to make vertical videos. You can try them too. Most of the time, the introduction part and hashtags works the magic here. Grab some popcorn and create a hell out of a title and intro. If you are missing out on ideas use the First Principle – why you created the video, what are you trying to say and why you want to say it? After you grab some ideas, look for popular and trending videos on Instagram. A simple way to find the trending videos is by clicking the IGTV button for the Instagram app and click the ‘popular’ tag in the category section. You can browse through videos and refer for good insights and ideas. You must have heard about the emoji videos that are making trends in Instagram and Facebook. Be creative, come up with some cools ideas, refer popular videos and learn the pattern. Learn some insights from them and find your niche. Add catchy emojis and captions and text on videos to make people engage with your content. If you don’t know any geeky video editing software, its fine. 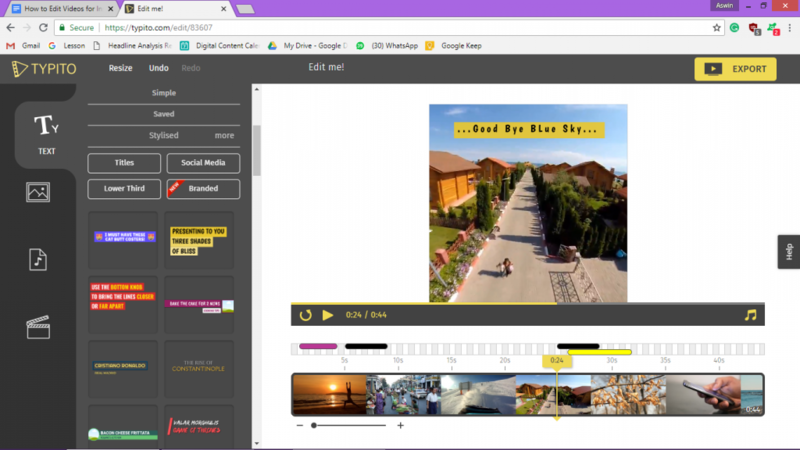 You can use our online video editors to easily edit, add captions, trendy emojis, frames and more. When you edit your videos, you should use catchy thumbnails. It’s the thumbnail in the video that makes people stare while scrolling casually. Make a compelling thumbnail that speaks for the video. If you are in doubt, ask your friends or family and garner their suggestions. Instagram is full of different kind of people and thus demands a variety of video contents to keep it fresh and going. The internet is demanding more videos as per statistics. Just because the Joneses find success in one category may not mean you should also create contents in the same category. Adopt the technicalities like the video ratios, texts and other factors that made their video successful, but not their ideas. You can follow your heart and create unique contents that you think are valuable. Most of the time, one of the successful video creators are those who created video contents for themselves and have started it out as just a hobby. After you created your awesome video, it’s time for a small touch up and edits to make it more awesome. Regardless of the Content, Square videos are viewed, liked and shared by many. It also has view completion rates than any other types of video. 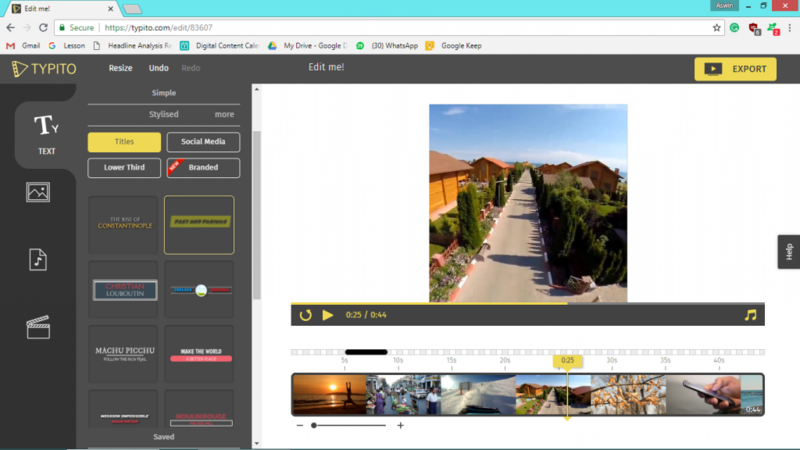 For creating easy to make square video, you can easily upload your video to Typito Online video editor. Upload your video and click edit. You will get a window with all the fonts, templates, and other tools right in front of you. At the top left, you can view the “ Resize” tab, click on it and select, “Square Simple”. The Square Simple” option is very easy to use. 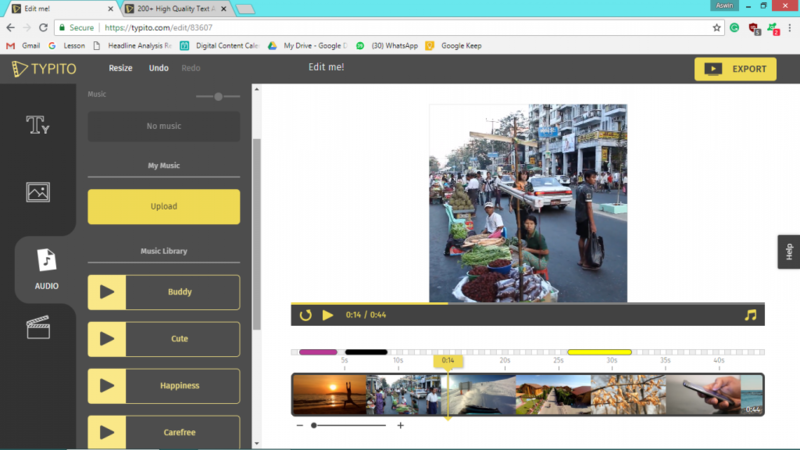 It converts your default video into a square video with just a click. Now your video is resized for Instagram and all set for the next editing process. Pause the video for adding texts. Move the cursor of your computer mouse to the TEXT icon at the far left, and you will get a variety of text styles. 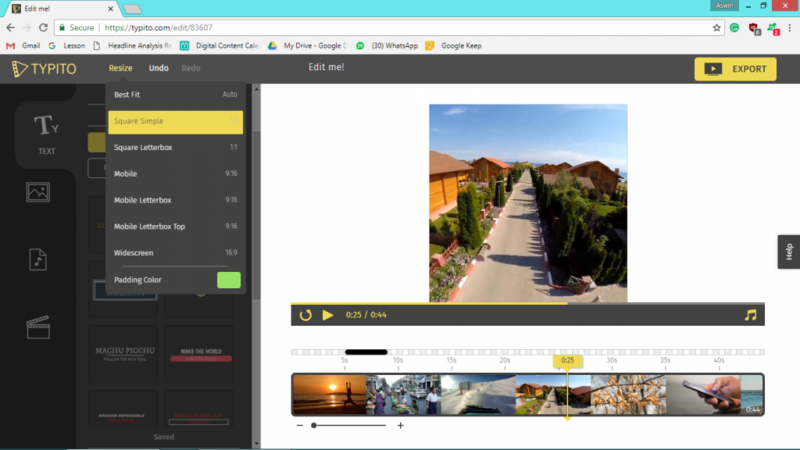 Select one text style and drag it into the frame of your video and place where you want it. You can also identify in the timeline where you have added the text timeline where you want to add cool texts. 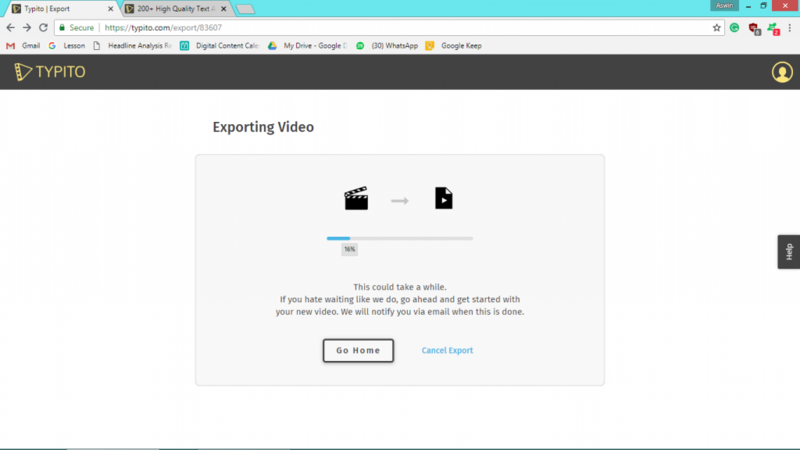 Click anywhere on the video and a text editor appears. Add attractive colour text, make the background of the text transparent and more. Now, it’s time to add some music to your videos and make it groovy. Select the “Audio’ tab right down the “IMAGE” option on the far left. Click it and you will get a few stock music samples. You can either go with the samples or upload a fresh piece directly from your computer. After you have successfully edited your video, it time to add your name badge in it. 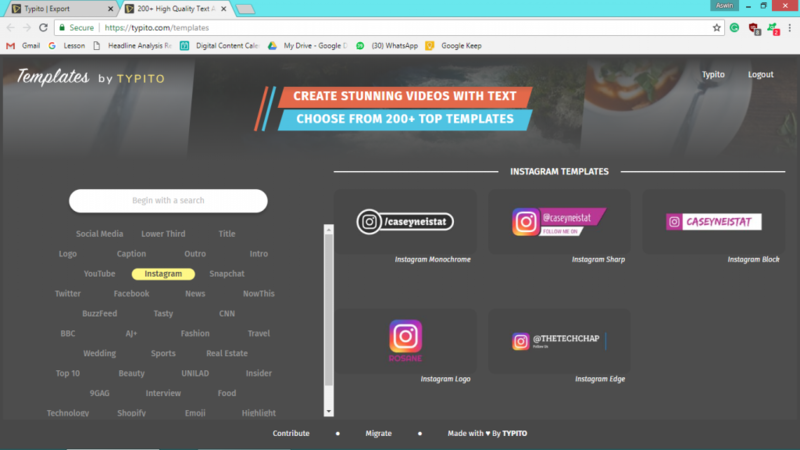 You can browse a plethora of stylish templates to make your video simple stylish and professional. You can access templates from the “TEXT” bar and under the “Stylized” category click on “More” option on the right. 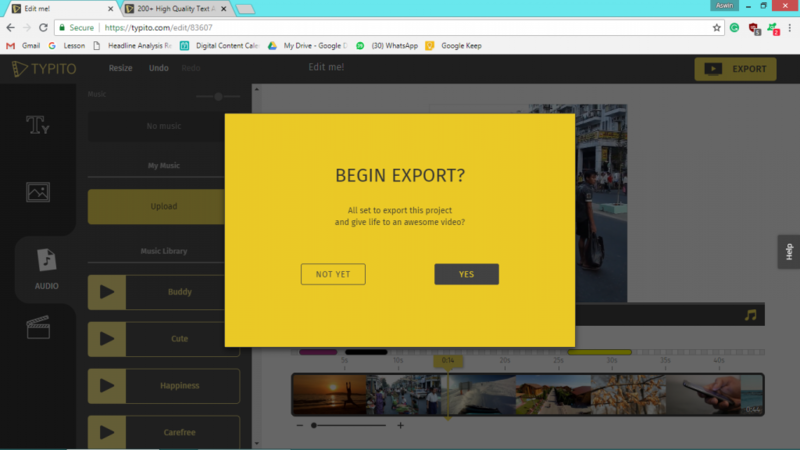 After all the editing process is done, you can click on the Export button on the far right of the Typito online video editor and click “YES”. So, Now you have learned about how to edit videos for Instagram the easy way. You will now be directed to a new window where the whole editing process is saved and your nicely edited video will be ready to get copied on your computer for a smooth upload on Instagram.